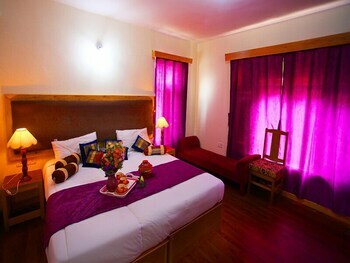 Located in Leh, Hotel Himalaya Villa is a 1-minute drive from Leh Temple and 5 minutes from Sankar Gompa. Featured amenities include dry cleaning/laundry services, a 24-hour front desk, and luggage storage. A roundtrip airport shuttle is provided for a surcharge (available 24 hours), and free self parking is available onsite. With a stay at Hotel Coorg International in Madikeri, you'll be within a 10-minute drive of Gaddige - Raja's Tomb and Raja's Seat. Free self parking is available onsite. With a stay at OYO 1456 Hotel Raj Classic Inn in Pondicherry (Heritage Town), you'll be a 4-minute walk from Sri Aurobindo Ashram and 8 minutes by foot from Raj Niwas.